Mon, Feb 4, 2019, 10:37 pm SL Time, ColomboPage News Desk, Sri Lanka. 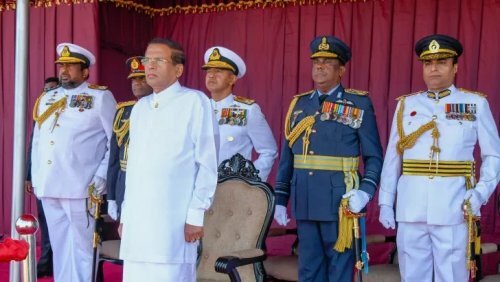 Feb 04, Colombo: Sri Lankan President Maithripala Sirisena today addressed the nation at the 71st National Day celebrations held at the Galle Face Green. The celebrations of the Independence Day is not only symbolizing our place in the world map as a free sovereign nation in the global political affairs. I make this an occasion to pay my respect to all those war heroes who valiantly fought in the battlefield, sacrificed their lives, became disabled, missing in action for safeguarding the freedom of the Nation. The Ministry of Defence has already decided to pay the salaries and allowances to the families of the members security forces - Army, Navy, Air Force, Police, Civil Defence Force – who died during the war and to those who were disabled during their lifetime. This is also applicable to the war heroes and those who were disabled in the Police and Special Task Force that was taken under the Defence Ministry recently. The 21st Century has been identified by most economists of the world as the "Century of Asia". Thus, the development of the Asian region would take place very speedy in this era and its benefits should be derived by all of us by making required preparations to be the centre for supply of skilled work force and competent professionals. Since 2015, I have attempted to enter into a new political journey with novel development experiences. The people have fulfilled their responsibility by changing governments at every time. But, most of the governments which came to power destroyed the aspirations of the people. All of us know that the real supreme institution of the people's supremacy, the Parliament has tarnished its image. How maliciously the MPs took actions to throw chilli powder at police officers inside the chamber and also to bring a knife into the chamber and to destroy the resources used by the MPs that are maintained by funds of the people. At present the people see the Parliament as a mirror image which shows the deterioration of the society. Today we don't have solutions for the unemployment and the debt burden. Both the issues are severe. We did not successfully achieve solutions for the ethnic issue or achieved economic victory. We established provincial councils more that 30 years ago. Today, from annual budget allocations to provincial councils, only 15 percent is left to development and capital funding. Of these, recurrent expenditure and maintenance costs are 85 percent. So, we need to act immediately to transform this upside down situation. I see the failure to hold provincial council elections for the last one and a half years as a challenge to democracy. Non Government Organizations do not come forward to talk about that. If the number of ministers is reduced to 25 with a single party running a government, as I believe it, is the wish of the people. Before questioning the duties and responsibilities that should be accomplished by the country for you, it is a necessary to think about the duties that should be accomplished by you on behalf of the country. 'What will we get?' or 'What we will receive?' are questions asked by most. But everybody knows that the most essential thing is to accomplish the duties and responsibilities on behalf of the nation. Today, what we need is not fraudulent pretension of serving the people, but a clear and far sighted clean governance. In our common vision, we have to protect our indigenous values and be cable of winning over the challenges of today's reality of globalization. 'Ma Desa Hela Desa, Ma Desa Hela Resa.